You would think that a poker book written by as accomplished a player as Phil Hellmuth would at the very least be a good read, and it wouldn’t be too far fetched to expect that there would be at least a good amount of sound poker advice contained in it. If that is what your expectations are though, you are going to be very disappointed with this book. 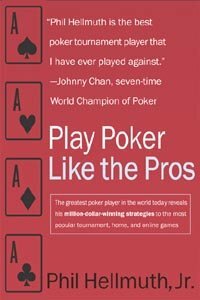 Sure, the book is from 2003, and the game has evolved quite a bit since then, but what really stands out here is that the book is from an era where poker authors weren’t known to provide much of any substance or practical value for everyday online poker players, and this book by Hellmuth goes even further than this. In fact, even with newer players, its advice probably does more harm than good, and in some cases is based upon some bad poker advice indeed. For example, he encourages players to run opponents out of pots who are almost drawing dead, in order to ensure that you win the pot and not get sucked out on by 4 outers hitting. Perhaps Hellmuth’s own difficulties in handling bad beats play a role here, but that’s not something worth teaching to others. Overall, this book gets my lowest recommendation. I consider the money I spent on it wasted, and it’s likely you will think the same should you make the same mistake.